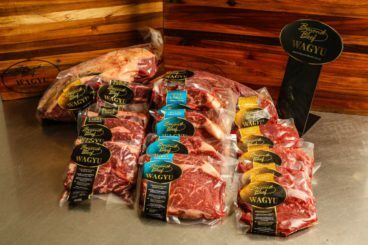 Fully traceable and DNA verified – 100% safety guaranteed meat…..
Grass-fed Wagyu has the tenderness and the succulence which characterises Wagyu beef. Our grass-fed beef also has the distinctive Wagyu flavour — described as sweet, delicate and nutty. Some like lean red meat, while others prefer it to be a liitle more fatty. Here are the characteristics of the various cuts so everyone can find what they want. Grill, thin slice best served medium rare. Grill, portion to flat iron and grill. Roast. Braise, Texas BBQ, Smoke, Roast. Yakiniku, Grill and thin slice. Grill, Grill and thin slice. Yakiniku, Grill, Roast and thin slice. Dice, Stir fry strips, air dry, Roast, Braise. Thin Slice, Roast, Corn, air dry.